If a visitor chooses to look from across the river, the magnificent Wat Arun stands tall on the water. Undoubtedly Wat Arun is thought as one of the most beautiful temples in Bangkok not only because of its location along the river but also the unique architecture. The fact that its image is on the 10-baht coin makes it even more of a symbol. 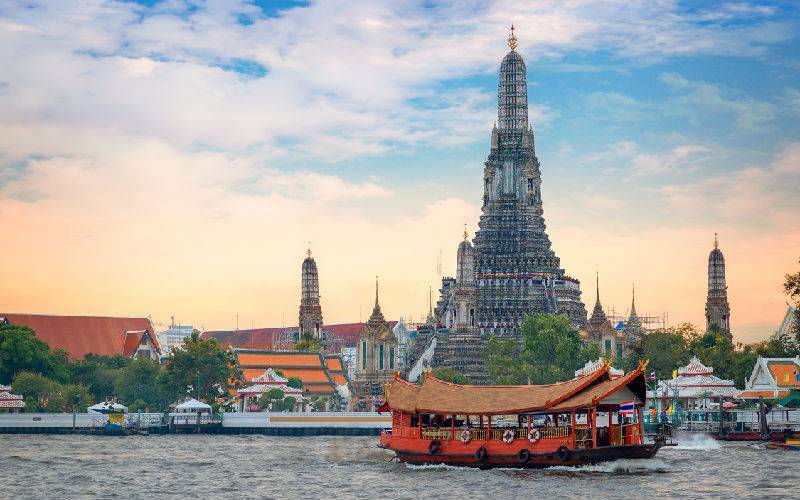 Given the prettiness of the beautiful craftsmanship and architecture, it is not surprising that Wat Arun is considered as one of the most striking temples located in Thailand. Likewise, the spire (prang) which is situated upon the banks of Chao Phraya River is also Bangkok's most acclaimed attraction. An approximately 70 meters high spire can also be seen, it is, attractively adorned with glass pieces that are vibrantly and colorful. There are elaborate designs that are specifically made using Chinese porcelain. If the visitors want, it is possible for them to ascent the central prang. Though there is a well-constructed railing to get the sense of balance utmost care has to be taken as the steps that are very precipitous. Going up the staircase is as difficult as going down! As soon as you reach the highest point in the area, you can see the winding Chao Phraya River as well as the Grand Palace, Wat Pho stands opposite to it. Interesting statuettes and sculptures of the Chinese warriors and different animals are aesthetically placed along the base of this structure. As a visitor makes an entry into the ceremony area, they can have a close look and appreciate the famous golden Buddha images placed there. Along with that, there are comprehensive murals that are used to embellish the walls. Though Wat Arun is an extremely famous place for tourists, it also is an imperative worshipping abode of the Buddhists. Everyone who plans to visit this place has to make it a firm point to dress up suitably and if ever at all someone wants to get the right attire for the place, they can get that from the entrance booth. Picture: Wat Arun Temple at sunset landmark of Bangkok, Thailand. It is widely held that Wat Arun was primarily projected and proposed by the King Taksin, in the year 1768. Moreover it is also held that once the king was done fighting in Ayutthaya which was seized by the Burmese army, the king reached at this temple at dawn. Afterwards the king revamped temple and gave it another name i.e. Wat Chaeng, which means the “Temple of the Dawn”. The Emerald Buddha was placed here as well, but only before the capital as well as the Palace was moved to the opposite side of the river. This can be noticeably seen at the Grand Palace. During the rule of the Rama III, the central prang was expanded. This was executed between the year 1824 and 1851. It is presently the most prominent and frequently visited site in Thailand. The embellishment of the spires that are prepared using porcelain, they were also included by the king, so as to make sure that they can shine bright in the sunlight. Empirically Wat Arun is basically an architectural demonstration of the Mount Meru, which is the epicenter of this world according to the Buddhist cosmology. In order to emphasize the temple's allegory, the outlying pagodas, along with the images of their protector that are facing the four directions are placed. The grand pagoda also does the same thing. Picture: Architecture at Wat Arun. Giant statues around the base Chedi Wat. The Hindu god Indra's four statues are placed above the second terrace area, moreover there are four more statues of three-headed elephant Erawan. On the Sidewalks of the river, there are total six pavilions that are designed in Chinese styles. These pavilions comprise of the landing bridges where the “Royal Barge Procession” reaches. The Ordination Hall is situated next to the pagodas, it has got the “Niramitr Buddha” image, which is believed to have been designed by King Rama II. It is widely held that King Rama II made the facade of the Buddha image, wood has been used entirely and afterward for the concealment a gold leaf has been used. There is a boundary stone as well as a tower of Wat Arun. This stone can visibly be seen nearby the Wat Arun's, Ordination Hall. This particular boundary stone has been constructed completely with marble. There are Mural paintings inside the “Ordination Hall” that narrates a story of the life of Buddha before he grew out to be the great Lord Buddha. Wat Arun entrance fee: 100 baht. Opening hours: The daily opening time of the temple is from 08:30 to 17:30. An utterly humble attire is a must while you are visiting. Wat Arun is a dynamically running Thai Buddhist shrine, the administration commands the visitors to dress up in a graceful style. This evidently holds that the men are required to dress up in proper pants along with either the short-sleeved or the long-sleeved shirts, obviously, the dresses like tank tops or sleeveless shirts are not allowed. Similarly, the females must not wear revealing clothes or knee-length skirts. 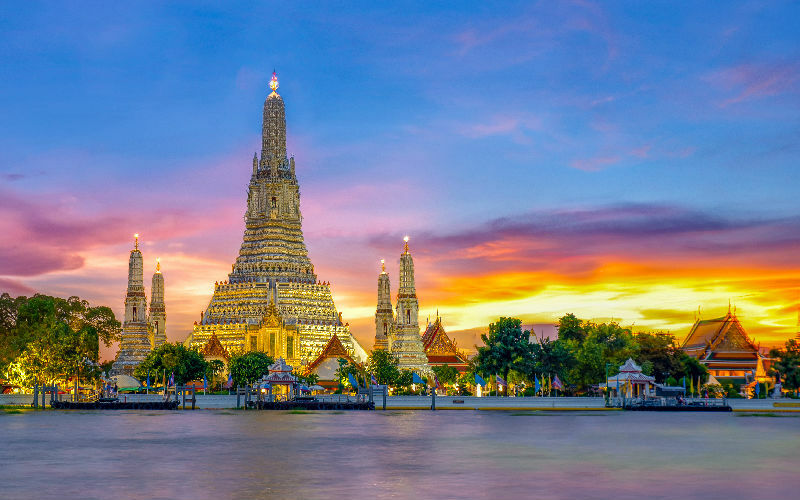 The Wat Arun was commonly known as the “Temple of Dawn” is situated on the famous Wat Arun Amarin Road which is on the West bank of the exquisite Chao Phraya river, it is on the opposite of the Wat Pho temple as well as the Grand Palace. Boat is the best possible way to get to this place. As a tourist, you can take a Chao Phraya express boat to Tha Tien pier almost at the Grand Palace which is actually the East bank of this river. Once you reach there, you should cross the river via the “Tha Tien express” boat service. 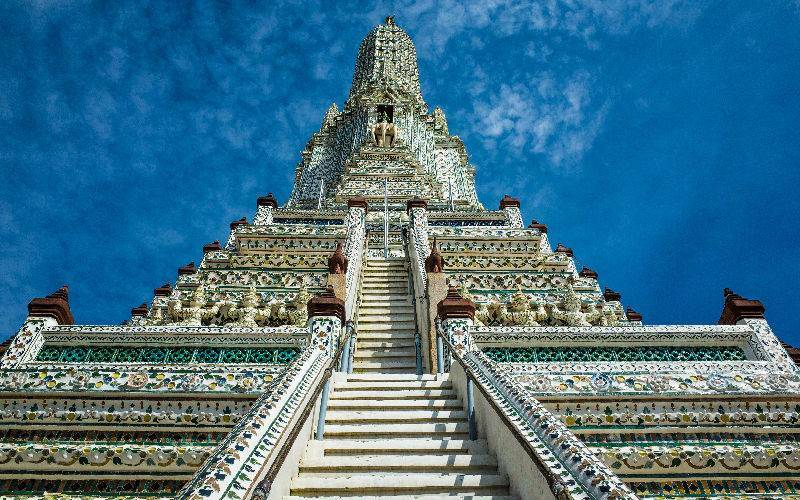 Throughout the brief ride, the visitors can experience exceptional sights and can have multiple chances to click wonderful photographs the huge Wat Arun prang. It is greatly endorsed to devote minimum one hour to visit the temple. Appropriately it is recognized as the Temple of the Dawn, there is no doubt that it is categorically spectacular especially at the time of sunset. The most peaceful and quiet time is usually said to be the early mornings, before it gets incredibly crowded. If you wish to see Wat Arun in the most hassle-free manner, you ought to choose to see it from the river. You can very relaxingly enjoy a dinner on the cruise while watching the grand prang strikingly well-lit. Picture: The best way to see Wat Arun is taking a ferry or find a fine resterant on the opposite of the temple. That why most picture of Wat Arun are took on the Chao Phraya River. Any visitor going to the Wat Arun can with no trouble join the two famous Bangkok tourist attractions. Right across from Wat Arun, on the other side of the river, you can see the Wat Pho. Wat Pho is famously called as “The Reclining Buddha temple”. For all the tourists, adjacent to the Wat Pho is Bangkok's prominent attraction, which is known to be the Grand Palace . Moreover upon the grounds, there is an Emerald Buddha temple, that is Wat Phra Kaew.